Our next stop was the site of the Battle of Bannockburn, a key moment in Scottish history. 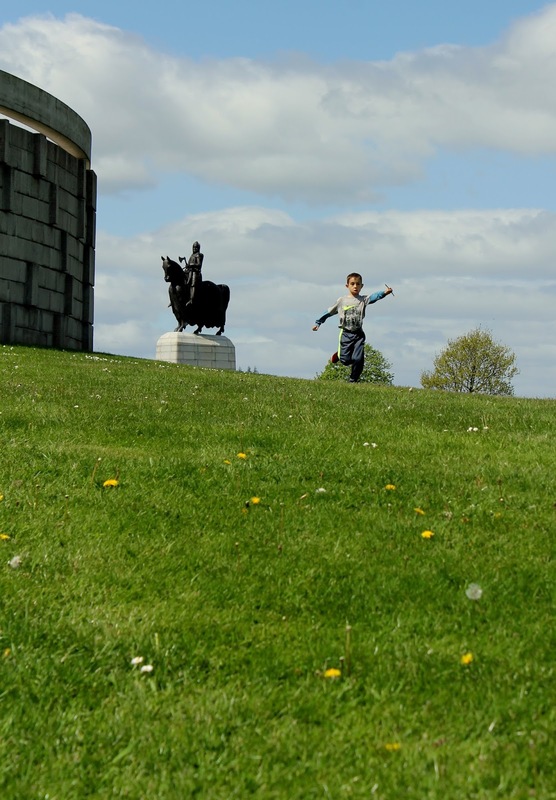 We let the boys run around the big field, marveling at how incredible it was that our children were playing in the same spot where Robert the Bruce led his troops into battle. Just as I started to fall into a peacefully perfect state of mind, Big Arrow yelled out, "Mom, he needs you!" Sure enough, Little Arrow pooped his pants. We now laugh at this incident, saying Little Arrow was just proving what a proper Englishman he has become, shitting on a Scottish landmark for independence. 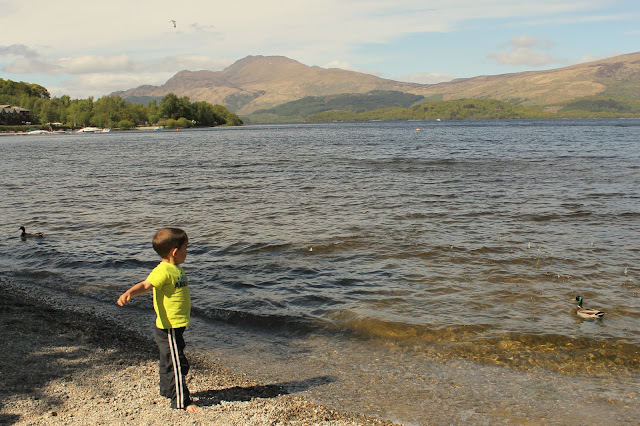 From Stirling, we drove to the village of Luss on the banks of Loch Lomond. As we drove there, I remember being worried that our accommodation wouldn't be very nice. I had trouble finding something in that area (waited too long to book on a school holiday week). There were few photos of the place I ended up reserving so I wasn't sure what to expect. The one thing I was confident of was how charming the village of Luss would undoubtedly be. I saw tons of photos of it when I pinpointed it as where I wanted to say. Needless to say, karma paid me a visit. Our rental cottage was lovely. Spacious, nicely decorated, great kitchen, even a beautiful patio. The village of Luss? A little disappointing. What those dozens of charming photos didn't tell me is that about a hundred tour buses a day roll through there. This photo of Little Arrow tossing pebbles into the loch doesn't show the bus load of senior citizens taking photos of him. (Creepy.) It was like staying where a cruise ship docks, without being on the cruise. 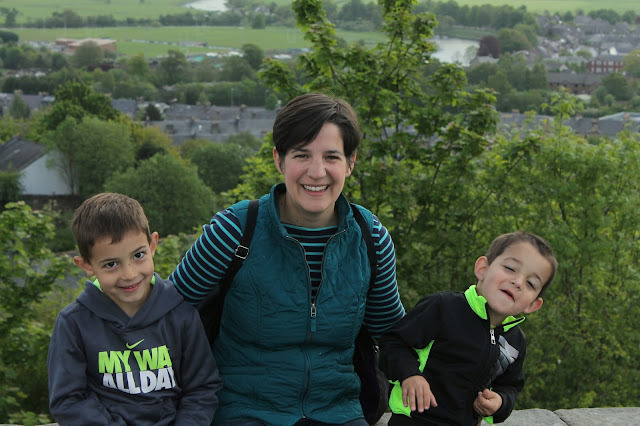 I don't write this to turn anyone off from traveling with their kids. Rather, I hope it encourages you that even despite these hiccups, frustrations, and less-than-Instagram worthy experiences, family vacations are still incredibly worthwhile. I wrote about a wonderful moment in Edinburgh and our enjoyment of Loch Lomond in previous posts, and I wouldn't trade a minute of our trip to Scotland just to avoid those experiences mentioned above. Just as no individual is perfect, no trip will be either. It's those moments in between the rude encounters, the tantrums, and long waits, that memories are made. Because as I tell people, we sometimes struggle through the average day at home with our boys. I might as well muddle through parenting in beautiful locations around the world if I'm privileged enough to be able to.